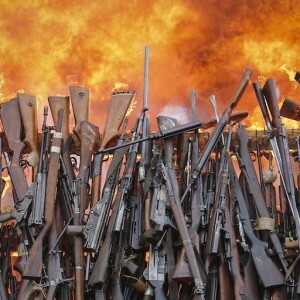 The African Union (AU) Commission’s decision to ‘silence the guns by 2020’ is a welcome one. Although the vision is clearly ambitious, even limited success would be a major boost for Africa, and especially those countries that continue to experience conflict. The AU’s roadmap for dealing with arms, if well implemented, should contribute to peace and security on the continent. The decision to dedicate every September to this cause until 2020 is one of the many steps in the right direction. The process, however, will not be easy. A number of hurdles must be overcome. Three immediate challenges include funding, disarming fragile communities (particularly in countries with peacekeeping missions), and ensuring that justice and the rule of law are maintained throughout the process. Disarmament of any kind is a sensitive process that requires dedicated funding. The January AU summit stressed the ‘urgent need for the AU to mobilise funding in support of the activities of the High Representative to enable him to carry out his mandate, particularly galvanising efforts of all stakeholders to scale up activities in the implementation of the AU Master Roadmap’. The historic July 2016 decision by the AU that all its member states implement a 0.2% levy on eligible imports to finance the AU may provide the means to meet this challenge. But the decision has been in force since January 2017, and its impact has yet to be felt. Before the introduction of this new levy, only 67% of assessed contributions to the AU were collected annually, with about 30 countries defaulting in one way or another. Nevertheless, the levy remains an important potential source that could help fund disarmament activities. A second challenge is ensuring that communities in conflict-prone countries ‘voluntarily’ surrender their arms and desist from re-arming amid continued threats to their safety. According to the African Development Bank (AfDB), Africa has the highest number of fragile states globally, affecting about 200 million people. Many of these are vulnerable to conflict and violence. Currently, eight of the 15 United Nations (UN) peacekeeping missions are deployed in Africa. This denotes how fragile the continent is in relation to the rest of the world. This kind of fragility portends a number of challenges, particularly for civilian disarmament. This raises the third challenge – that of balancing security and justice in the context of peacekeeping missions. Civilians will only respond to a call for voluntary disarmament if they are guaranteed security. The state and its various organs have to be seen to operate within a framework of good governance, rule of law and respect for human rights. Unfortunately the institutions responsible for delivering justice and security in fragile and conflict-prone states are often weak or dysfunctional. The peacekeeping fraternity is aware of the problem. The Office of Rule of Law and Security Institutions, located in the UN’s Department of Peacekeeping Operations, aims to help post-conflict countries re-establish their justice and security systems. The office provides expertise and guidance in the areas of police, justice, corrections, security sector reform, mine action and the reintegration of ex-combatants into civilian life. The AfDB has also developed a 10-year strategy (2013–2022) to help African countries transform into stable, integrated and prosperous economies able to generate social opportunities and build sustainable justice and security institutions. The bank is currently financing a range of peacebuilding, state-building and democratisation processes in post-conflict and fragile states. These activities can improve reform processes in the justice and security sectors. To increase the chances of successful voluntary civilian disarmament, the AU should encourage relevant member states to integrate both the UN and the AfDB approaches noted above. To achieve this, countries with peacekeeping missions would need to integrate their national disarmament processes within the UN’s Office of Rule of Law and Security Institutions. This would ensure safety to those surrendering arms, and provide capacity building to national structures in the target country, improving the sustainability of the intervention. At the same time, the AU should encourage the rest of its member states to include the costs of Silencing the Guns by 2020 in their national budgets, and where necessary seek the support of the AfDB, as provided for in its 2013–2022 strategy.